In early 2016, British short track speed skater Elise Christie won the overall European Championships after winning all of her races. The Olympic speaker also came first in the 500m, 1,000m and 1,500m races in Sochi, Russia. These victories were particularly sweet because two years earlier at the 2014 Winter Olympics she was disqualified from the 500m after an Italian skater collided with her. Two days later Elise was disqualified again, this time in the 1500m for failing to cross the finishing line. Shortly afterwards she was penalised for colliding with a Chinese skater in the 1000m semi-final. Voted the Nottingham Sportswoman of the Year in 2013 (she has lived there since 2005), Elise Christie had three brilliant years between 2013 and 2016, when she won 10 gold medals, eight silver medals and four bronze medals. In all, the Olympic Speaker has collected 25 medals through competing in the European Championships and the World Championships over a six-year period. As a speaker, Elise captures and holds the attention of audiences when she shares her memories of the (mostly) highs and lows that she has experienced throughout her career. Delegates from many sectors can relate to how thin the line can be between success and failure and can empathise with how important it is to face both in the same way. 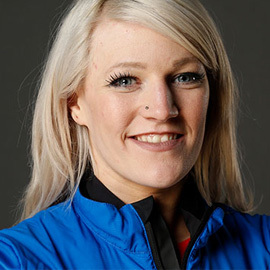 To book Elise Christie as the peak performance speaker for your corporate event, function or conference, simply contact the Champions Olympic Speakers agency by filling in our online contact form. Alternatively, call a booking agent directly on +44 1509 85 29 27.